Kydd's Redd Symbol is a wonderful example of how selective breeding is in producing top horses. His easy going temperament and willingness is seen in all his get. The short coupled, balanced conformation is part of the package. 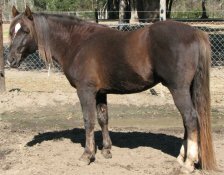 If you are breeding for color, we have several of his offspring on site with his beautiful liver chestnut color. Symbol's gait is strong and his next generation is as good or better. A goal of our breeding program is to only breed horses that are "right" and to strive to improve with each generation. Symbol is certainly a horse that meets these criteria and has proven himself. Symbol was born June 28, 1999. 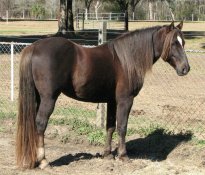 He is out of Lady Bird, a 16 hand, liver chestnut mare registered with the Appalachian Singlefoot Horse Breed Association (ASHBA A-35). His sire is Appalachian Kydd, an amazing black stallion registered with ASHBA (ASHBA C48T). 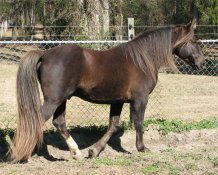 Both parents are well bred, gaited and have outstanding conformation. We are very proud of Symbol. He is flashy, naturally gaited and intelligent.